Wilfred is a marijuana-smoking, beer-drinking, potty-mouthed pup. 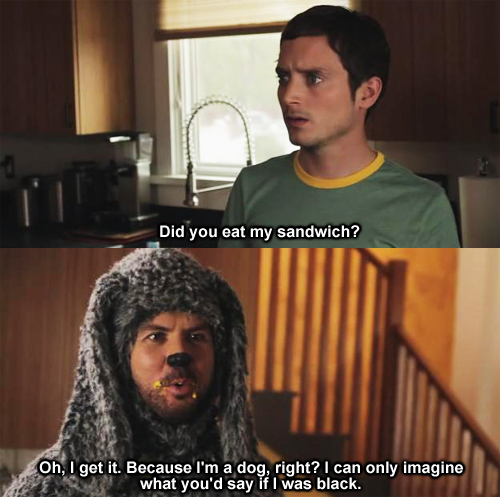 To Ryan, his owner’s neighbour, Wilfred is a human in a dog costume. To everyone else he’s just a canine. Either way, Wilfred is as misbehaving as they come and often pushes Ryan to do things he normally never would. Wilfred’s best moments come when he’s trying to be like a true dog, like making friends with the popular pooches, destroying a house when kept inside, or sneaking treats from Ryan’s co-workers. Whether as Charlie Brown’s not-so-faithful dog or battling the legendary Red Baron in the skies, Snoopy is certainly a force to be reckoned with. Lucy knows this first hand, as she has been victim to Snoopy’s wet dog kisses on a frequent basis. Let’s not forget Snoopy’s symbiotic relationship with Woodstock the bird, as well as the critically-acclaimed Snoopy Dance, which has swept the nation for many years. Poor Satchel Pooch, always having to deal with the megalomaniac stylings of Bucky Katt. Somehow, Satchel’s kind, gentle nature always shines through even in the face of cats being cats. Satchel has a bunch of friends, including other neighbourhood dogs who are part of his playgroup and ferret neighbour Fungo Squiggly. Best of all, Satchel is Canadian (all the good ones are! ), his roots being traced back to Cheticamp, Nova Scotia. This mutt has more lives than a cat. Many episodes have centered on SLH’s bad behaviour and he keeps being invited back into the Simpsons home with open arms. Through various misdeeds, SLH has been sent to obedience school, found himself in the possession of Mr. Burns as an attack dog, been sent to live with Officer Lou, and abandoned at an ostrich farm. Every time, though, the dog returns to his family and they are happy to have him back. #1: Scooby Doo – Scooby Doo, Where Are You? While few can stand his nephew Scrappy Doo, Scooby Doo is one of the most beloved hounds in history. The scaredy dog doesn’t want to deal with the mysteries his human friends stumble upon and would rather be in hot pursuit of Scooby Snacks. With his best pal Shaggy by his side, these two do everything they can to avoid being chased by a fiendish specter, but always seem to end up on the wrong end of that equation, leading to the capture of various spooks. So, which dogs should have made this list? There were certainly many I had to cut from my preliminary research, so I’m sure to have missed something. Perhaps we’ll put Scooby Doo on the case of the upset reader! I used the Whip Cream rim to give an impression of a rabid dog, foaming at the mouth. It also helped cool down some of the heat from the Hot Sauce in the shooter. Physically and visually pleasant… reminds me of myself. 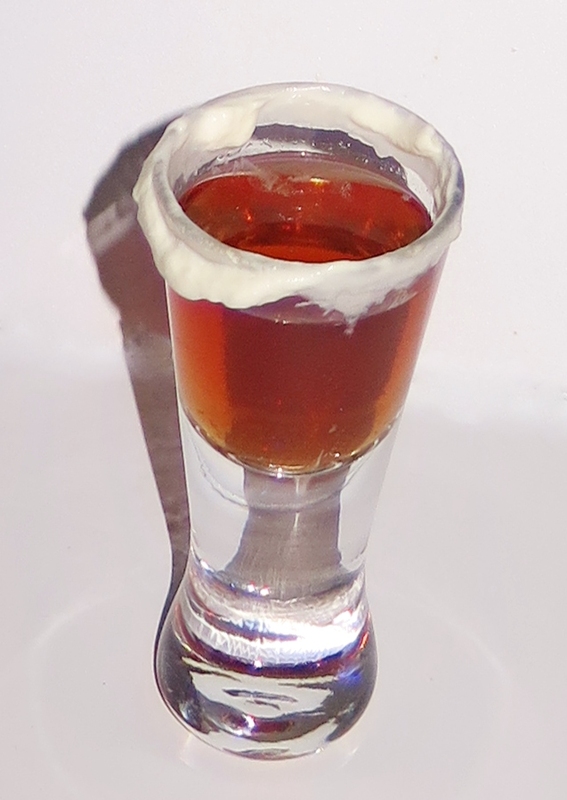 All in all, this was a pretty good shot and I’d suggest not going crazy with the Hot Sauce and using a Vodka that goes well with the Raspberry Liqueur. This entry was posted in Shots & Shooters and tagged Bucky Katt, Canines, Dogs, Get Fuzzy, Hot Sauce, Mad Dog, Mr. Burns, Officer Lou, Peanuts, Pups, Raspberry Liqueur, Red Baron, Santa’s Little Helper, Satchel Pooch, Scooby-Doo, Scrappy Doo, Shaggy, Shooter, shot, Snoopy, Snoopy Dance, The Simpsons, vodka, whip cream, Wilfred, Woodstock by Daniel Wilson. Bookmark the permalink.